Developing and sharing ideas, especially ones which are complex, can be difficult. When presenting it to other people you should take care that the idea will be understood clearly, as well to ensure it will be engaging. Using Mind mapping method helps to solve both of those issues. How you can creatively present mind maps? The most interactive way is to draw a mind map on paper. However, if you want to share them to a bigger audience or share further, then it’s better to use some presentation software app for that. Why not use the one you probably have and are familiar with – good old PowerPoint :). Regardless of what stage you are at in the development or planning process, you can use different mindmap graphics to help your audience understand. Your presentations won’t be boring with colorful, interesting PowerPoint graphics. All example images below can be found in Creative & Simple Mind Map PPT Diagrams slide deck (see details by clicking the pictures). 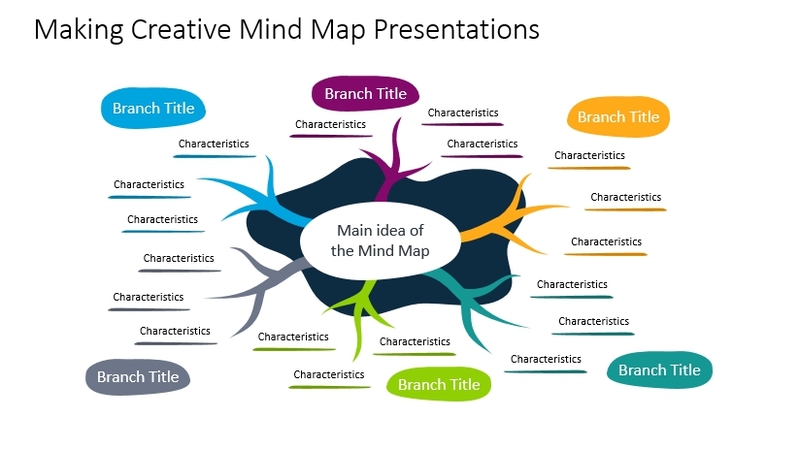 How can you use mind map diagrams to help your presentations? Here are a few simple ways. To make your mind map illustration look unique and personal, consider using hand drawn style graphics like the one below. 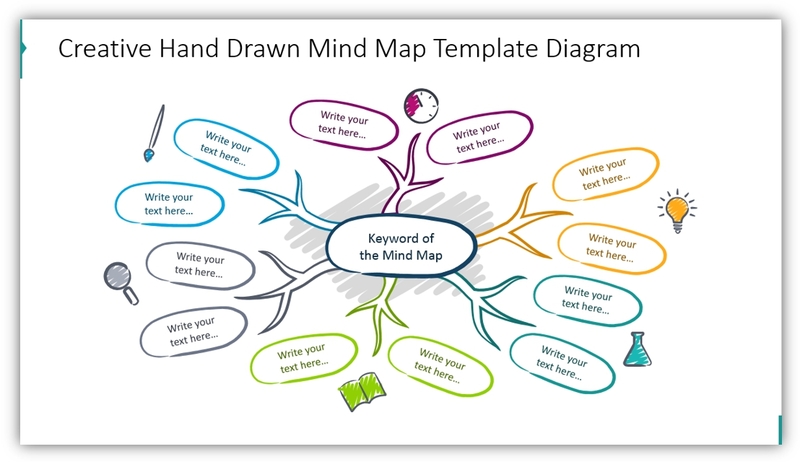 You can use the mind map diagram template we’ve designed. They are versatile and there are several different styles to choose from. This mindmap is drawn in a “free hand” style which adds creative flair to any presentation. The colors can all be changed and customized, as can the text. Struggling to find a compelling way to share your business plan with your team or potential investors? Use a mindmap as your guide! Show your audience how different departments and areas of your company come together and collaborate, while also highlighting the important role that your strategies and ideas play. This particular example has five branches. You can extrapolate on different points and areas of focus with additional “branches” or “arms” to help paint a complete picture for your audience. If you’d like to provide more detail on fewer points, consider the head graphics diagram. 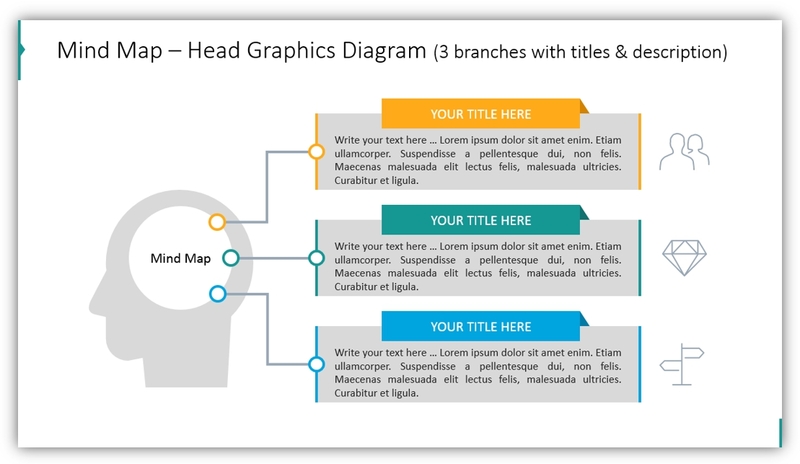 The head graphic is a direct visual metaphor for a mind map. It shows clearly that you’re dealing with matters of thinking and creation. Adding a few icons to each item creates a better visual association. As in the case below, where we added people symbol for human resources item, diamond for business value and arrow sign for strategy selection or planning. 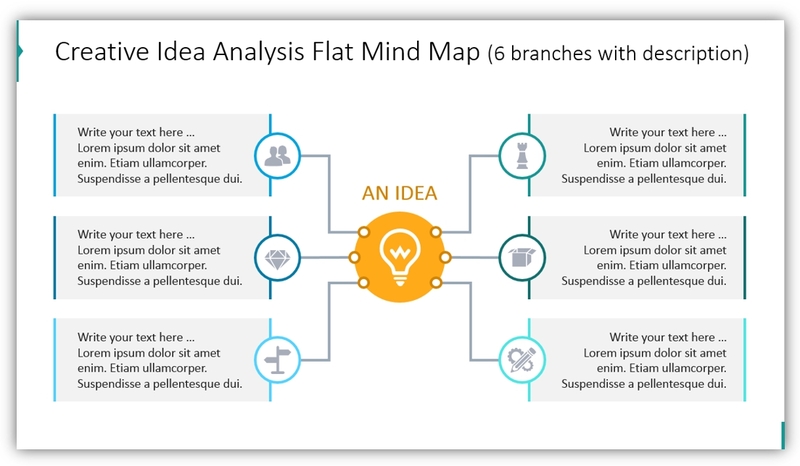 You can visualize an idea analysis in a visual way, using light outlined mind map illustration, like on the slide below. Break down your concept by branching off into specific sub-topics. To make such presentation slide more outstanding, consider adding placing the full slide size photograph in the background. Regardless of whether you use these or other forms when working with a mind map, take full use of visual representation. Adding colors, illustrative symbols support the power of the mind map approach, whether sketchnoting on paper, presenting on the flipchart or working in presentation software. If you will go for digital presentation e.g. in PowerPoint, use the benefits of vector graphics. Having editable shapes, you can always adapt your diagrams to suit your needs. You can place your text and different aspects of the diagram anywhere you would like. You can add or remove text as you need. You can add or remove icons and even change the color. The outline style icons even allow you to select the outline color and thickness so that everything will look exactly how you’d like it to. 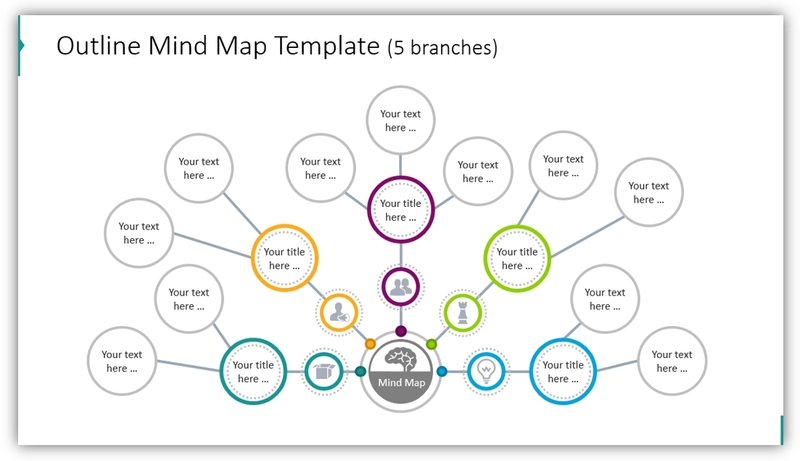 To help you creatively present or share your mind map structures, we have designed the mind maps visuals template. These PowerPoint graphics can all be modified to fit your presentation topic. The graphics are offered in three distinctly different creative graphical styles so you may choose the design which suits you and your audience. For printable mind maps you can use in worksheets or notes for your attendees, we suggest using outlined mind map shapes. If you’re only going to present on a screen, then using a mind map with a dark background may be the best choice. In addition to the mind map icons, you will receive 24 additional vector icons. 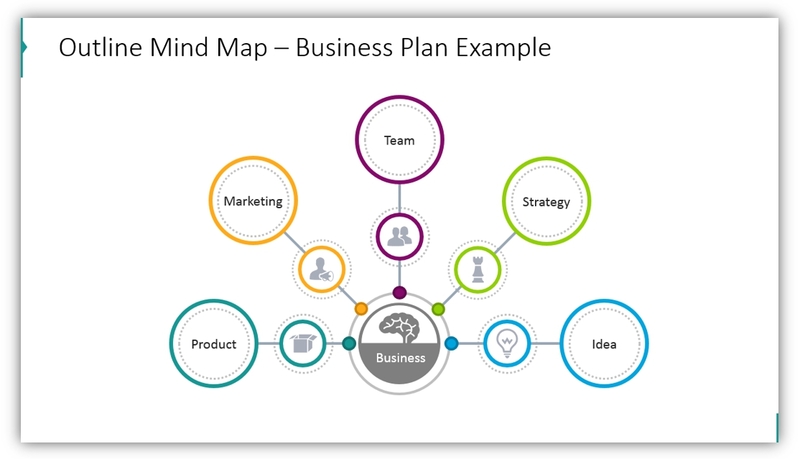 They are useful for illustrating the specific mindmap branch concepts, to represent different business categories and industries, for example. You can also check flat infographics collection to add more variety to your presentation graphics.